Sorry I haven't updated in a few days. I've had technical difficulties. I got a puppy last Saturday! His name is Lucky! (His full name is Lucky Dud, for whatever reason, my dad wanted my dog named after him. My mom says she'll reserve her naming rights for a kid, LOL.) 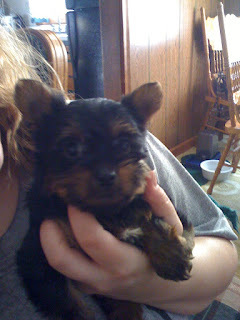 He's a 3/4lb, 7 week old Yorkie who thinks he is a Great Dane. He is just about the cutest thing ever. He takes up all my spare time, which I guess is good. 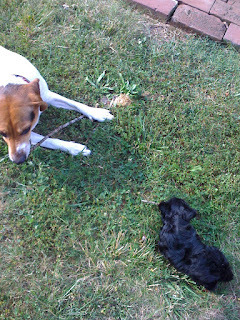 He likes to chase and fight with Dixie (my brothers Beagle). I should note that the letter expressly states he cannot receive candy, soda, cookies, magazines or newspapers. So basically a letter or card is pretty much it. He wanted me to say I to everyone, too. I also want to say: A Very Happy Birthday to my Daddy. He turned 54 today! I love the puppy. So now you will have to post something almost weekly or more so we can see him grow. I am so glad that you finally heard from Tyler. Not quite sure what to think about that address. I'll get a letter in the mail first thing today after Bryce's birtday. Hope the puppy helps pass the time while Tyler is away. I didn't realize he was leaving so soon. How long will he be gone? Just reading this made me cry. I feel for you. If you need someone to talk to, I'm here. I love you!